Today, I want to briefly discuss two Boris Karloff films that I adore, but do not get much attention. Be advised, there are spoilers for both films ahead. The Black Room (1935), is in some respects average and predictable, but it’s Karloff’s performance in a dual role that helps it shine. 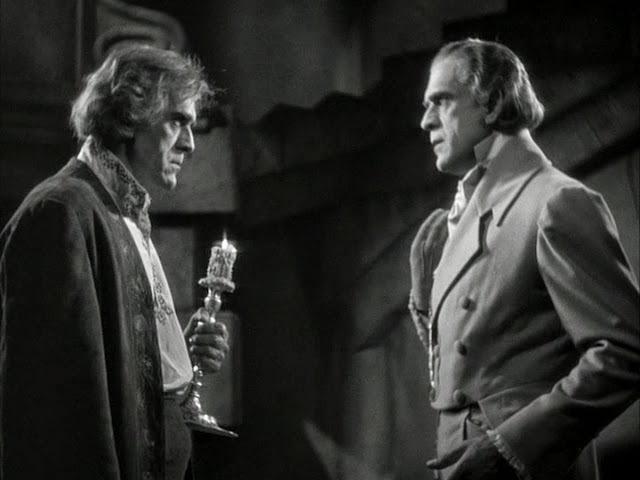 Karloff plays twins Gregor and Anton, both members of a European royal family in the late 1700’s. The great thing about this film is how it showcases Karloff’s acting range as the kindly twin Anton and the depraved twin Gregor. While Gregor’s appearance is slightly disheveled, and Anton has a paralyzed arm, there are no significant differences in makeup effects for the two characters. 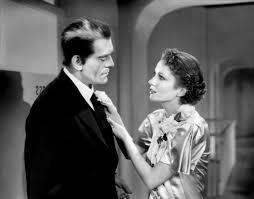 The radical difference in demeanor is all due to Karloff’s versatility of performance. Although Anton is predictably murdered by Gregor at the halfway mark, it was great to watch Karloff in a kindhearted role that more closely mirrored his own personality. Some of Karloff’s other great scenes in the film are when Gregor assumes Anton’s identity, only to struggle with maintaining a facade of kindness as well as mimicking Anton’s disability. 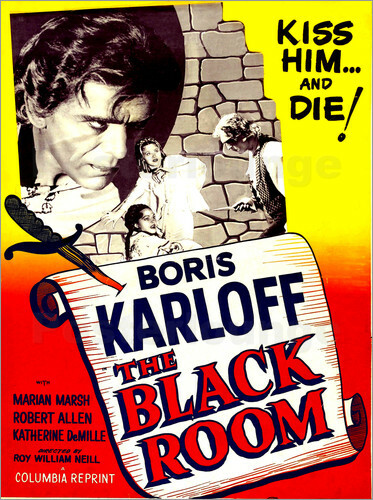 The Black Room is available on DVD in the Boris Karloff Collection – 6 Movie Set: The Black Room, The Man They Could Not Hang, The Man With Nine Lives, Before I Hang, The Devil Commands, and The Boogie Man Will Get You . The next film I want to discuss is The Walking Dead (1936), directed by Michael Curtiz. The Walking Dead is, in many ways, a ripoff of Frankenstein, but inverts the tropes of that film so extensively that the results are rather unique. Karloff portrays John Ellman, who is framed and wrongfully executed for murder. After being put to death by electric chair, Ellman is resurrected by a benevolent scientist who wishes to learn the secrets of the afterlife. Contrary to the salacious movie poster (see above), Karloff isn’t a bloodthirsty monster at all, but rather, a victim. Karloff’s performance is so effective because of his wonderfully expressive eyes, which bleed vulnerability. Like his character in Frankenstein, Karloff plays the role of monster-as-victim, with some important differences. Ellman retains his skills as a concert pianist and remains verbally articulate. He has a surprisingly sweet and gentle platonic friendship with the lead female character. And, most importantly, he doesn’t kill anyone. Ellman unwittingly becomes an agent of karma or of God’s judgement, because when confronts the men who framed him, they kill themselves. 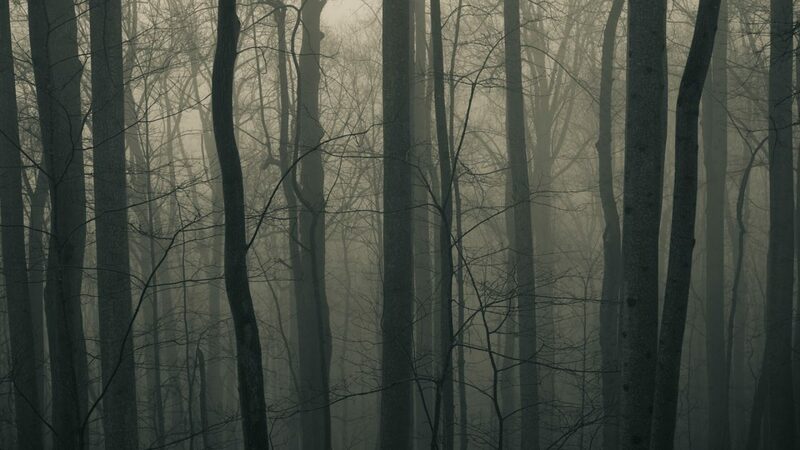 Each time, he is distressed to see them die and saddened that his own unjust death is never explained. 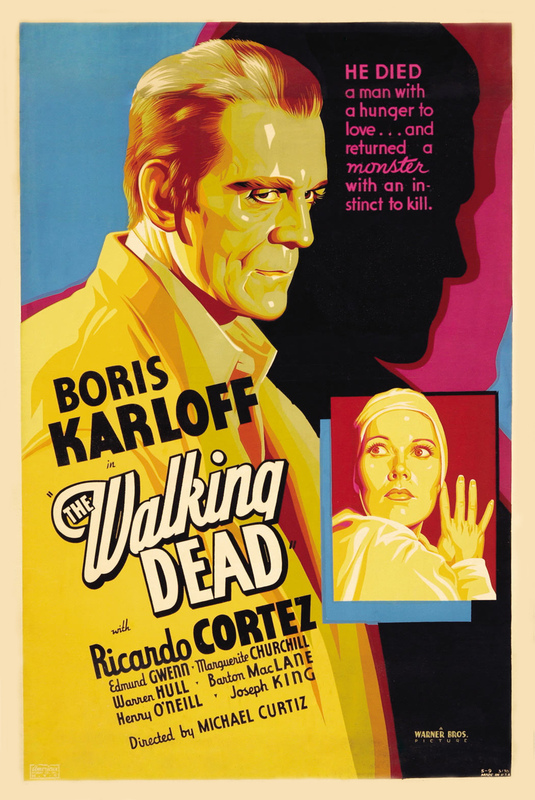 The Walking Dead is available as part of a 4-film DVD set, Karloff & Lugosi Horror Classics (The Walking Dead / Frankenstein 1970 / You’ll Find Out / Zombies on Broadway) . This set is worth purchasing for this film alone and for the excellent commentary tracks on The Walking Dead and on Frankenstein 1970.